Earlier last week, I sat on a blue plastic chair in A&E, crying to my mother on the phone. How am I here again? I thought to myself. And why the hell am I crying? It was only a foot injury, and probably a minor one, but in the moment it was turning my whole world upside down. I tried to put things into perspective: my best friend nearly died and was rushed to hospital just a couple of weeks previously – that was something to cry about. I’d only tripped and twisted my ankle, possibly fractured my metatarsals. Remember how I wrote about being too busy and life passing me by? I managed to slow down for about 48 hours and then hopped back onto the crazy train. I know it’s no good for me – I get palpitations when I check my monthly to-do list, which I end up checking about 20 times in a day sometimes – and yet I can’t stop. Well I can, but I haven’t yet reached the life-threatening epiphany that will mend my ways. Can a to-do list tendency really kill me? Maybe. Probably. I have this deep, dark fear that if I don’t do 10 times more than is required of a normal, healthy human being, I will fail somehow. Fail whom? No idea. No one’s actually requiring me to go above and beyond in every little mundane detail. I know this blog is no therapy session or AA meeting (Hi, my name is Clem and I’m a compulsive over-achiever… Hiiii, Cleeeem) but if any of you lovely readers have tips to overcome the demons that tell me I’m never trying hard enough, my sanity will appreciate you all the more for sharing them. In the meantime, here’s an overachiever cake for you. I don’t think I’ve ever had so many compliments about any baked goods so far from my office colleagues, and I kind of wish I hadn’t brought the cake to work because I would have liked to eat more than one slice of it. It is phenomenal. It looks pretty impressive, if I do say so myself, and it tastes even better. If you ever feel like your life’s a mess, make this cake, see how people marvel over it like it’s an original Picasso, and tell me if you still feel bad. Oh and… I deleted my weekly to-do list. Almost deleted the monthly one but then I panicked because I don’t think I’ll survive Christmas without it. Baby steps! Add the dry ingredients in a large mixing bowl, lightly combining with a fork. In a big cup, combine the soya milk and apple cider vinegar. Set aside to curdle. If you haven’t already, melt the coconut oil. Make a well in the centre of the dry ingredients. Add this, the vanilla and coffee extract and curdled soya milk to the bowl of dry ingredients, and fold them in. Pour the cake batter into the cake tin, smoothing out the top with a spatula. Bake for 40-45 minutes, or until a knife comes out clean. Now prepare the coffee cream frosting: in a large mixing bowl, whip all the ingredients together, either with a hand-held whisk or an electric one. When the cream is smooth and glossy, place in the fridge. For the caramelised walnuts: line a tray with baking paper. Add the sugar to a small saucepan on medium to high heat and leave to melt. After about 10 minutes, the sugar will have bubbled and turned to caramel – DON’T stir it, as that will disturb the process. Drop each walnut half in, one at a time, stir it around in the caramel and then lift it out with a teaspoon. Place onto the baking paper to cool. When the cake is baked and cooled, slice in half through the middle. Spread a third of the frosting over the bottom tier of the cake, then sandwich the other tier on top. Frost the cake with the remainder of the frosting. 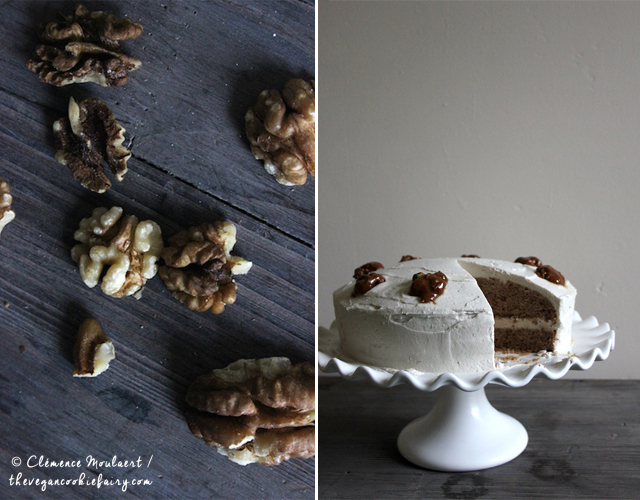 Decorate with the caramelised walnuts when they are cool. Thanks, Emma 🙂 I actually have that book and I’d started reading it ages ago… and never finished. Might need to get back to it. Or to reading in general. This is a beautiful cake. I want to make this! Maybe you can slow down. Or maybe you can’t. Maybe it’s just your nature. And maybe managing the anxiety about it is what you need to do. Or just accept it/you and stop stressing about the stressing. You should definitely make this, it’s the best cake EVER! And it doesn’t even contain chocolate! It’s tricky, isn’t it? Sometimes I manage to relax a bit, but slowly my bad habits creep back and take over again. Maybe it’s just something I’ll have to learn to manage, as you say! You are not the only one who thinks they need to do more. I think this is an inbred thing, more so for women, as we think we need to be ‘superwoman’ and manage to work, cook, look after people, do a degree with our eyes closed, do the housework, the gardening, and run the country whilst we’re at it. But unfortunately we need to have a life, we need to stop and look at the simple things, the sky, everything around us, the splendour and beauty. It’s difficult especially if you’re young. I think growing older makes you realise that all the pressures we have are self imposed, and if we fail, so what? If we don’t get all the monthly tasks done will the earth stop, will someone die? If the enswer is no, we need to stop worrying and live life, and slow down. I agree, I’ve noticed this generational trend that pressurizes young women to be ‘superwoman’, as you say. It’s so hard to break out of that cycle. I don’t know if it’s an innate thing for a lot of us or is it just that that’s how we’re moulded to be? Maybe it’s like the chicken or the egg question and there isn’t really an answer. Put something visible on that doorstep immediately, something like a big pot of flowers or something large and physically-imposing that you will HAVE to slow down and manoever around ! No more tripping! Edinburgh streets and staircases seem o have a lot of cobblestones and twisty corners so I am surprised more people aren’t at their local Emergency Room getting splints, casts or other! However on the (selfish) plus side, this means you may be at home a bit more, concocting more delicious dessert recipes for us all to try!!!Haha! Get well soon and avoid climbing that incredibly gorgeous Arthur’s Seat for awhile too! P. S We LOVED our recent trip (oops! Sorry!) to Scotland! Fab place. Gorgeous. 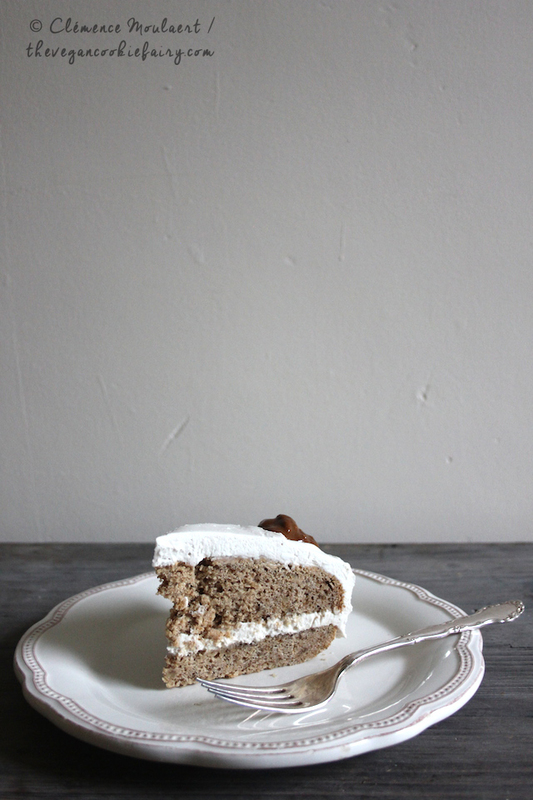 Gorgeous cake and another gorgeous, honest post. I too feel the need to do far too many things at once and always have more swirling around in my head. You’re right, you may always live with a certain amount of anxiety and that is probably what helps you achieve as much as you do. Just don’t let it envelope you. You’re right, sometimes it’s important to be ‘selfish’. I don’t think that word is well-suited actually because is it really selfish to take care of yourself so you’ve got time and energy to devote to others? Self-care is a more accurate term.